I'm sure it's part of my genetic encoding. My family has lived in the Midwest for generations. Some farmed the land, others worked hard in the cities. No matter that I was raised in St Louis~the prairie's blue sky and views that seem to stretch forever calls to me in a manner that is indescribable. Prairie plants have to be a part of my garden. and plenty of prairie plants can grow in our gardens. I love their rough and tumble looks and their hardy natures. They aren't shy and retiring with many of them towering six or more feet tall. oranges, purples, bright yellows and even hot pinks. Dee you must add this to your garden! including the heat and humidity. they can even survive 18 inches of rain. Prairie phlox is a perfect addition to the prairie garden. It's botanical name is Phlox pilosa. We know this beauty as the practically perfect pink phlox. It's a prairie plant and is found growing in most prairie states. as you can see PPPP is just about finished for the season. it's beautiful pink fragrant flower and long bloom. and attracts bees, butterflies and even hummers. in planning for these sun worshippers. Someday there will be a small prairie at C&L. to give that fantastic pop of prairie the gardener wants. All of them can grow and thrive in the heavy clay soil. are different from other coneflowers in several key ways. other coneflowers in several unique ways. as if reaching for the sun. Those uplifting petals immediately identify the Tennessee Coneflower. Tennessee Coneflower will lie down on the job if it is not in full sun....A lesson I learned a few summers ago when the above photo was taken! The garden never ceases to teach me lessons! 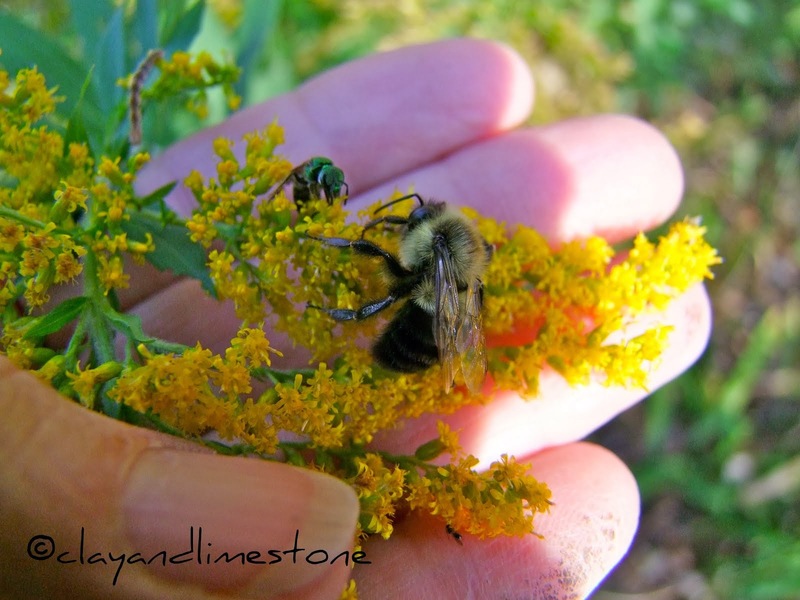 Thanks for stopping by ~ Wildflower Wednesday is about sharing wildflowers/natives/naturally occurring plants no matter where you garden in the blogasphere. It doesn't matter if we sometimes show the same plants. How they grow and thrive in your garden is what matters most. I hope you join the celebration..It's always the fourth Wednesday of the month! edit: I am hoping to have a logo for WW soon! On our trip to Co. last summer I looked forward to seeing the prairies. It is not a land form I had seen before. Very dramatic when viewing the vastness and the sky, but so intricate when you look down at your feet. Parts of the drive reminded me of dunes and I half expected to see the ocean over the next rise. Oh how I would like that p.pilosa for my meadow in progress! All my Indiana ancestors must be the explanation for why I continue to struggle to get it right - your prairie is beautiful. Oh, Gail, I love, love that Emily Dickinson quote!! My husband planted clover for the bees and my dream is to have a meadow or prairie in part of my yard. BTW, what exactly is Texas Star? I wasn't sure if you were posting or not but I guess so. The prairie seems to be such a fascinating place. If I had enough land I'd have a nice meadow area for sure. 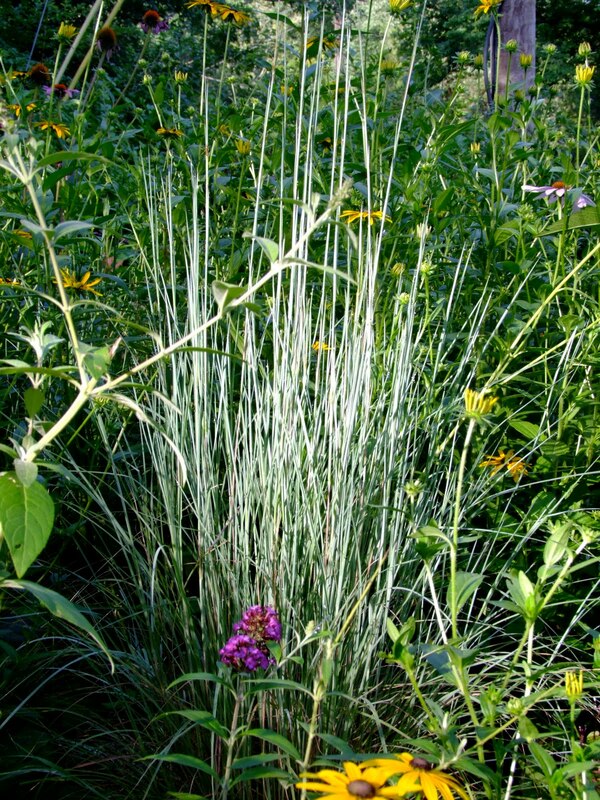 I am getting ready to order Little Bluestem today-finally. Thrilled to see you have it. Tina, I have seeds of LB if you want some! Monica, Penstemon X (P calycosus) is a beauty and grows even in the shade! Glad you like it! I've joined in with a post on wildflowers today, too. I had planned to visit our local prairie park before today to take some photos, but the rain and heat have kept me away, so instead I have a few plants growing here. Thank you for the lovely tour of Dee's garden. Wow! Such a beautiful place, even in 100 degree heat, it would be hard not to linger there for awhile. Very nice. As you work on getting your Praire garden I am working on a meadow...I joined your meme today. Kudos to you Gail for all you do in promoting the joys of gardening with native plants. You continue to inspire me to add more native plants to our garden. My maternal grandpa had a horticultural degree, and he loved native plants. We took many walks together on his mostly-native Missouri farm, where he'd point out and identify his favorite native plants for us kids. I'll always be grateful to him for nurturing my wonder of the natural world. Thank you for dreaming up Wildflower Wednesday! I look forward to it every month. We don't really need anymore rain this June, but I'm happy for the day off from work today and a bit of free time so I could participate once again. Love your photos. You always have some very interesting plants that have me running to Google to satisfy my curiosity and learn more about them. MMD had an unusual pink milkweed on her site this morning. What natural beauty this land has! I recognize so many of these wildflowers of my childhood days. I did my first wildflower wednesday post today. Is they a sign up place for this event? I love these prairie flowers. I can't wait until my PPPP and PenX blooms. Probably next year. You always have such lovely photos of such beautiful flowers. I've never seen a coneflower with upcurving petals...but now if I ever do, I'll be able to recognize it as Tennessee coneflower! I don't have room for a prairie here, but we do hope to have at least a small wildflower meadow here someday...if we can convince the gophers to eat elsewhere! Hello! Lovely photos...especially enjoyed seeing your coneflower pics! This year I let my yard go wild and have had fun discovering what's already there (we've only had the house a year). I found primrose, horsemint, Mexican hat, wild morning glory, and some other little flowers I don't know the name of. It's been fun. Oh that fence with the susans, it makes me homesick for the land of my ancestors! What a grand display and story, Gail, loved every word and image. I can't wait to see your logo. How about a Mister Linky too? Rocky Top is having a hard time in my soil conditions, we lack limestone! I love these, especially the coneflowers, just beautiful. I also love the idea of Wildflower Wednesday, being a bit of a wildflower girl myself. Maybe I will join in next time although my photos can't compare to these! I just love the prairie plants too! I learned today that the Tennessee coneflower is very promiscuous and will interbreed with other coneflowers readily. I saw a hybrid with the up-curving petals that was bright magenta. I tried to get a shot of it, but it was raining pretty hard then. Here's my Wildflower Wednesday post: Asclepias purpurascens. Thanks for hosting! MMD, They are pretty darn friendly and the pollinators aid and abet that behavior! I've some nice offspring with petals that turn up and down! Glad you joined the celebration. I love the prairie too...at my garden the native landscape is primarily shortgrass prairie/savanna plants, which were the dominant pre-settlement landscapes in my little area. Thanks for sharing your pictures; I was sorry to miss out on posting this month due to torrential rains keeping me and the camera out of the garden the last few days! I enjoyed your post, as always. I like those Tennessee coneflowers. Gail, this is absolutely fabulous! I have only seen a bit of prairie twice--once in Windsor, Ontario, which is the southernmost part of Ontario and has a bit of preserved prairie, and once in Powell Gardens, outside Kansas City, Missouri. I love prairie plants though giving them what they want is a bit of a challenge for me with my wet clay. Still, I persevere. Gail - a wonderful prairie education and photos. I do love that Tennessee coneflower, but since I grow open-pollinated varieties in abundance, I wonder if it would cross and not be the same. i have that problem with solid orange gaillardia getting cross-pollinated with the native bi-color. Very lovely Gail. I have some wild flowers in my Flag Pole Garden that I planted several yrs. ago. They are a hardy lot with small blue flowers. I don't have a clue as to their ID. They come back most yrs. This is the best yr. ever. Gail - thanks for responding so quickly! Since it will be 101 today, I'm planning my seed stock for next year in the cool of the indoors. Hey Gail, lovely post, and your picture of rose gentian or Texas star is better than mine although I did profile them today. Thanks for all that you do to promote wildflowers and other natives. 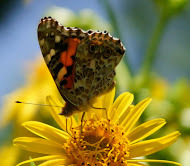 We need an appreciation of them for the pollinators. My dears~all my comments disappeared when i switched to a new domain name...Hoping they will reappear shortly! Now they are back, but other things have disappeared...Sigh! We lived in Iowa for 3 years, and I loved the midwest. Well, not the crazy-cold winters we had and the humidity in the summer. But the fireflies, and the salt of the earth people. People in the midwest in general are different from those on the coasts. I liked the unpretentious people I worked with in Iowa. And you love the unpretentious flowers of the prairie! Not the most flamboyant, but pretty and serviceable and sturdy, like the people. Gail, I posted about my Texas Bluebells. I've got to find a source for the Sabatia campestris. I bought one small plant at a private garden in Raleigh but it didn't come back after winter. These flowers are tough and gorgeous at the same time! 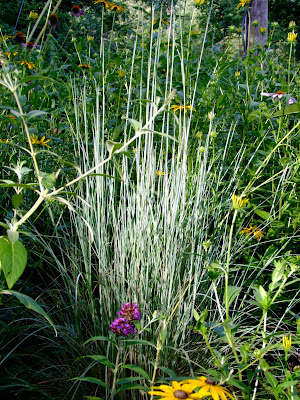 As for the grasses, my Little Bluestem didn't survive our wet winter. I needed to choose the dryer spot. Thank you for hosting Wildflower Wednesdays, Gail! Hi Gail, Nice wildflowers! I love the Echinacea tenn. but I don't think mine survived. Like you said, they like full sun and when you've got fifty three plants vying for soil space in a 3x5 area, well, only the strong survive. LOL My bad. My PPPP are still going strong. I'm going to be heartbroken when they're finished because I've come to expect and enjoy their beauty and fragrance. Please tuck my little Lachenalia rubida into your next Wildflower Wednesday. My heart goes out to you, in the loss of your sister. I love prairie planting - its a dream of mine to see echinacea growing wild as far as the eye can see. Echinacea hates my soil and never lasts longer than 2 years so I have to be content seeing it in everyone elses garden. Gail as you can see I'm late with my submission for the meme this month and it was so sad to read about the loss of your dear sister. Your camera is a great evangelist for natives. Keep it up! I just noticed you were using Mr. Linky. I know you've been to my post, but I wanted to put the link in, anyway to show I was part of the party. My lunch is finished, and I better get myself back to working on the house after I balance our checkbooks. I hope your day is going well!